October is upon us which means all hallows eve is approaching. As exciting and fun as this night can be, it can also be a strain on the purse strings. Halloween isn’t just for kids anymore and it’s a night that everyone dresses to impress and aims to have a cool costume. Luckily, there are tonnes of ways to make a Halloween costume at home. With a little creativity, some old clothes, fake blood and face paint you really have limitless options. There are the all-time classics – the witch, the ghost and the cat, that people will use year after year. However there are many more options that don’t require much effort or funding. Animal costumes are always fun and creative and don’t require much more than face paint. YouTube has some great videos on how to do animal face paint which can be really useful. Why not step it up from the cat costume and try a tiger or a zebra? A simple idea for any brunette is Disney villain, Cruella DeVille. All a Cruella costume needs is a big fur coat and white hairspray which can be found in any decent joke or costume shop. Tie your hair back with a bit of volume and spray half your head with the white hairspray and the look is complete. If you happen to have a Dalmatian teddy around the house, why not bring it for added effect? A really last-minute costume for anyone is the burglar disguise. All you need are some black clothes, a balaclava and a black bin bag to be used a sack. Alternatively to the balaclava, black face paint can be used to make an eye mask in the style of the cat burglar. 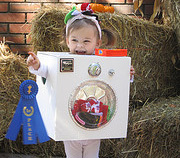 It is so easy, and a lot more fun, to create your own costume for Halloween. You can go wild and let your creativity bloom, as you can be whoever you want to be on Halloween. The crazier the better, and having a cool costume will set your night off to a great start. Happy haunting! Image top: City of Marietta, GA public office.